Cyclone Nargis hit Burma on May 2, 2008, killing over 138,000 and affecting at least 2.4 million people. The Burmese military junta, the State Peace and Development Council (SPDC), initially blocked international aid to storm victims, forcing community-based organizations such as the Emergency Assistance Teams-Burma (EAT) to fill the void, helping with cyclone relief and long-term reconstruction. Recognizing the need for independent monitoring of the human rights situation in cyclone-affected areas, particularly given censorship over storm relief coverage, EAT initiated such documentation efforts. A human rights investigation was conducted to document selected human rights abuses that had initially been reported to volunteers providing relief services in cyclone affected areas. Using participatory research methods and qualitative, semi-structured interviews, EAT volunteers collected 103 testimonies from August 2008 to June 2009; 42 from relief workers and 61 from storm survivors. One year after the storm, basic necessities such as food, potable water, and shelter remained insufficient for many, a situation exacerbated by lack of support to help rebuild livelihoods and worsening household debt. This precluded many survivors from being able to access healthcare services, which were inadequate even before Cyclone Nargis. Aid efforts continued to be met with government restrictions and harassment, and relief workers continued to face threats and fear of arrest. Abuses, including land confiscation and misappropriation of aid, were reported during reconstruction, and tight government control over communication and information exchange continued. Basic needs of many cyclone survivors in the Irrawaddy Delta remained unmet over a year following Cyclone Nargis. Official impediments to delivery of aid to storm survivors continued, including human rights abrogations experienced by civilians during reconstruction efforts. Such issues remain unaddressed in official assessments conducted in partnership with the SPDC. Private, community-based relief organizations like EAT are well positioned and able to independently assess human rights conditions in response to complex humanitarian emergencies such as Cyclone Nargis; efforts of this nature must be encouraged, particularly in settings where human rights abuses have been documented and censorship is widespread. Cyclone Nargis hit Burma's Irrawaddy Delta on May 2, 2008 (Figure 1), killing over 138,000 and directly affecting at least 2.4 million more[1, 2]. A storm of this magnitude poses challenges to any government; however, Cyclone Nargis hit Burma (also known as Myanmar), a country impoverished under decades of military rule and with decimated health and education sectors, and collectively rendered this ill-prepared country unable to recover after a crisis of this scale [3–5]. Following the cyclone, a humanitarian crisis ensued, one which arguably became a complex humanitarian emergency (CHE), defined as "a humanitarian crisis in a country, region, or society where there is total or considerable breakdown of authority resulting from internal or external conflict and which requires an international response that goes beyond the mandate or capacity of any single and/or ongoing UN country program" [6–8]. The Burmese regime, the State Peace and Development Council (SPDC), initially refused international aid; refused to lift visa restrictions for humanitarian workers; and used state resources, including troops, to support a scheduled referendum on a military-backed constitution [9–13]. May 4th 2008, Cyclone Nargis path retraced with view of areas affected by Cyclone Nargis in the Irrawaddy Delta, Burma (UNOSAT). As international pressure mounted, the regime began to allow some access by international aid agencies, particularly following an unprecedented visit to Burma by UN Secretary General Ban Ki-moon on May 22-23rd. Concurrently, the Tripartite Core Group (TCG), composed of the UN, ASEAN, and the SPDC, was formed and became the lead entity for the Nargis Response. While most international efforts to aid storm survivors were stalled, local community-based organizations and individuals were often the first-responders. 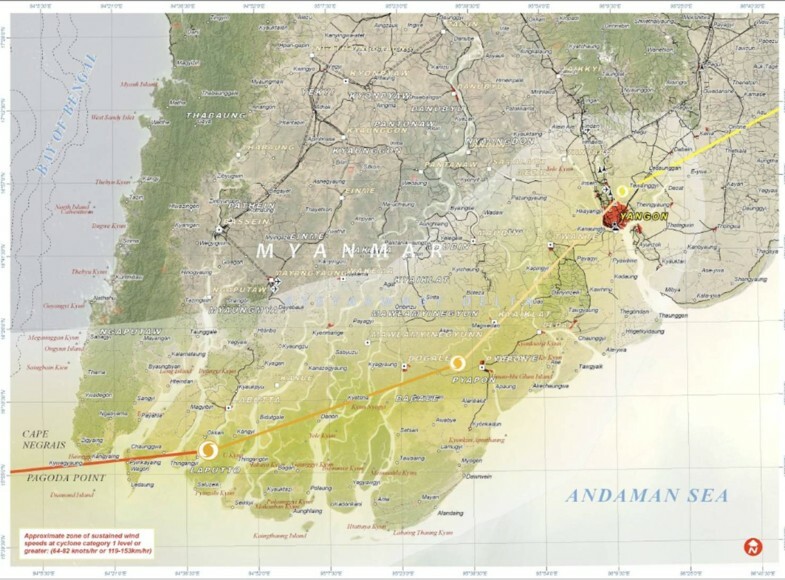 Within three days of the storm's landfall, the Emergency Assistance Teams-Burma (EAT), a community-based network of organizations and individuals, was formed and began providing relief to cyclone survivors. EAT volunteers, mostly cyclone survivors themselves and unaffiliated with the regime, received aid donated by communities living along the Thai-Burma border (in Burma or Thailand), as well as through international organizations that sent aid through Thailand. Members of the relief teams, eventually totaling 44 teams of several volunteers per team, also received training in Thailand on emergency response, food and water distribution, and basic first aid provision, and with donated supplies were able to quickly provide assistance to some of the hardest-hit communities in the Irrawaddy, Rangoon, and Pegu Divisions. Within the first three months, EAT delivered aid to over 180,000 survivors living in 87 villages of 17 townships, providing essential assistance such as clean water and food, clothing, and shelter; assisting in proper disposal of corpses; facilitating family reunification; and providing emergency healthcare. In the second phase of the EAT response, from August 1, 2008, to January 31, 2009, the teams continued to provide water and food aid, but also focused on rehabilitation efforts, including the rebuilding of homes and aiding in the re-establishment of livelihoods, education, and health infrastructure. Widespread violations of fundamental freedoms and human rights perpetrated by the SPDC have been well-documented [17–19]. Within weeks of the storm, independent organizations [20–22] and the media began to report human rights abuses in cyclone-affected areas, including forced relocation of survivors, restrictions on humanitarian aid, and confiscation and diversion of aid[12, 23–26]. Official assessments, including those conducted with the SPDC, generally did not address these concerns[16, 27]. This reality convinced EAT and its partners that an independent assessment of the human rights situation in the affected areas was needed; information vital both for informing comprehensive program planning and policy but also for community empowerment and freedom to participate in reconstruction efforts. In February 2009, EAT and its partners released a report "After the Storm: Voices from the Delta," documenting human rights violations in the wake of Cyclone Nargis. The report generated significant controversy, particularly with respect to the nature of the assessment itself. EAT had performed a human rights assessment using qualitative human rights methods, that included in-depth interviews with relief workers and cyclone survivors. However, the report was widely viewed as an assessment of the overall humanitarian response, for which the methods used would have been inappropriate. EAT members were misconstrued as being from the Thai-Burma border areas or otherwise not recruited, as they had been, from affected Delta communities. And the report was represented as a call to limit humanitarian assistance, although no such call was made in the report or its recommendations. Human rights abuses continued to be reported during the latter phases of the Nargis response. Independent relief workers continued to be arrested and imprisoned, including an additional five independent donors and ten relief workers, detained in September-October 2009 [29–31]. Meanwhile, the regime's contribution to relief and rebuilding efforts continued to remain limited. In September, 2009, the UN Human Settlements Programme (UN-HABITAT) estimated that some 450,000 people in the Delta were still in dire need of shelter 18 months after the storm; the junta had constructed some 10,000 houses, international donors built some 25,000 houses, while the Burmese people themselves had built 209,000[32, 33]. Towards the end of 2009, while the SPDC spent over $570 million on advanced fighter jets from Russia [34, 35], the TCG appealed for $103 million for priority reconstruction initiatives, of which only $88 million was pledged by the international community [36–38]. Starting in May, 2009, EAT conducted an additional round of interviews with relief workers and cyclone survivors to assess the human rights situation during the later phases of the relief effort, one year after the storm. The findings presented here include personal accounts from interviews conducted during the earlier phases of the response and from later rounds of data collection, accounts not included in "After the Storm." A collaborative group was formed to conduct a community-based human rights assessment, which included EAT, the Mae Tao Clinic, local human rights organizations, and the Johns Hopkins Center for Public Health and Human Rights, which contributed technical support for training community investigators, developing survey instruments, training in interview methods and conduct of human subjects research, and provided support for data analysis. Qualitative research methods were used, as they allow for detailed comparison of the experiences of survivors and relief workers and, given the security situation and the arrests of several prominent citizens engaged in independent relief work [39–41], such methods were also the only feasible approach for conducting human rights investigations with minimal risk to participants and interviewers. One-on-one interviews were therefore employed to collect in-depth data from survivors and relief workers. Three rounds of data collection were undertaken, the first from June to September 2008, then in October to November 2008, and May to June 2009, to gather additional information on the later phases of the response. Using purposive sampling, 103 in-depth interviews, 42 with relief workers and 61 with cyclone survivors, were conducted in Burma's Irrawaddy and Rangoon Divisions as well as along the border with Thailand. In all, 87 communities in 17 townships were represented by at least one interview. Interviewers were recruited from members of EAT's community networks that were providing emergency relief inside the Irrawaddy Delta after the cyclone. Interviewers were recruited on a voluntary basis and were chosen for their knowledge of and access to the communities, particularly those hardest hit. The interview format utilized participatory research methods and in-depth qualitative interviews focusing on selected rights abuses which were identified during preliminary formative research[42, 43]. The selected relief workers were trained in Thailand to conduct interviews. Trainings focused on case finding, interviewee confidentiality and security, informed consent, screening candidates for interviews, open-ended qualitative interviewing skills, accurate and secure data gathering techniques, contact-based sampling methods, and human rights principles. Refresher training sessions occurred regularly, as relief workers returned to the Thai border for re-supply of aid materials. Local human rights organizations, including the Karen Human Rights Group, provided assistance during the trainings. The qualitative interview format for the relief worker interviews was developed for the assessment based on initial key informant interviews with relief workers during the first month after the cyclone. Interview domains were developed along with specific probes through an iterative process that incorporated input from study team members and other leaders from organizations operating in this environment. The guide was then piloted with several local team members and refined for clarity, ease of use, and brevity. The interview guides and consent scripts were translated into the three most commonly used languages in survey sites: Burmese, Skaw- and Pwo-Karen. Domains covered internal displacement; discrimination in provision of relief; community responses; and personal security and logistical concerns. Later, domains were added to explore topics of child labor, security and other concerns related to women and debt, as these issues emerged during recovery efforts. A similar process was used to generate a qualitative instrument for interviews with Nargis survivors. The EAT team decided that only adults (18 years or older) would be interviewed, as it was difficult to assess the agency and protection for children in Burma. A semi-structured instrument that utilized a flexible set of open-ended probes was developed to elicit in-depth information about human rights concerns. Domains for survivor interviews included questions about the survivor and his/her family before the cyclone; experience during the cyclone; knowledge or warning of the impending cyclone; the situation and events experienced by the survivor and his/her family immediately post-landfall until the day of the interview; negative experiences; and plans for the future. During the second phase of the assessment, much of the survivor interviews in the affected areas focused on probing further into personal experiences of human rights abrogation and protection. Interviewers were trained to utilize pre-designed screening questions to aid in the identification of candidates with detailed primary information regarding any one of the human rights abuses. Once potential candidates were identified and oral informed consent had been obtained, the confidential and anonymous interview was conducted in a secure location and the set of open-ended probes for the relevant domain(s) were then employed by the interviewer to continue gathering detailed and sensitive information. During the interview process, detailed questions or probes were used to elicit further details of experiences, a process that serves both to gather the most information possible as well as to ensure internal consistence and to differentiate personal experiences from hearsay. Because of the risk associated with collecting this information in Burma, interviewers took numerous precautionary measures to ensure the protection of both the participants and themselves. No personal identifying information was collected and, prior to participation, oral scripts to obtain verbal consent were used- as opposed to signed consent forms- to prevent unintentional revelation to outsiders of an individual's participation in the study. Interviews were recorded using a portable digital recording device after obtaining the participant's explicit permission regarding its use and after providing basic instructions to omit details that might reveal the identities of the survivors or their communities during the interview. Interviews were identified by the date and location of the interview, logged in a simple string of numeric codes, a method that also ensured protection of interviewer and interviewee. Interview data was sent to a central location where they were translated into English, transcribed, and re-checked for accuracy by bilingual EAT staff. The English language transcripts were then analyzed by the JHU team using qualitative analytic approaches. The data from the interviews were analyzed based on relevant human rights themes, chronology of the event(s), location, demographics of affected communities, demographic information of interviewee, and details of government, military and NGO involvement. Data were then analyzed for widespread patterns and differences using a modified qualitative matrix. At the time of final reporting, any additional information that was believed to potentially place the interviewer or interviewee at risk of identification was removed to further ensure protection. Ethical approval for this study was granted by the Institutional Review Board (IRB) of the Johns Hopkins Bloomberg School of Public Health, and by the Burma Medical Association's Ethical Committee. In total, EAT teams conducted 103 in-depth qualitative interviews; 42 were with relief workers from cyclone-affected areas, 61 were with Nargis survivors. Of these, nine relief worker interviews and four survivor interviews were conducted in Thailand during the latest round of data collection, in May-June 2009. Names of participants and villages, as well as other identifiers that were revealed during interviews have been removed for the security of participants and members of their communities. Findings from these interviews are summarized in Table 1. A year after the Cyclone, respondents reported that basic necessities remained unavailable for many. Food supplies, particularly agricultural outputs, were insufficient in quantity and quality due to the immediate destruction of land and crops by the cyclone and exacerbated by the loss of farming equipment, increasing debt, and interruption of labor, as survivors were forced to prioritize other needs, such as acquiring water or rebuilding shelters, over farming. Access to potable water remained problematic; a consequence of wells and ponds still contaminated by saltwater as well as the end of the monsoon rains. Shelters remained inadequate, and many residents were still homeless or living in temporary housing. Among those who had their houses rebuilt or were provided with new ones, several voiced concerns for the stability and protection provided by the new structures. A year after the storm, issues such as diarrhea and illnesses related to water shortages, as well as psychological disorders, were noted. Basic health services remained insufficient for many survivors, a reality even before the cyclone. Local relief workers and clergy often received training and provided basic health services and, in some cases, medicine when this was possible. Although delivery of aid was hampered by difficulties in physical access and travel, government interference, direct and indirect, was also frequently reported. These included travel restrictions, check-points along routes into the Delta, "fees" to access disaster areas, extensive monitoring of aid workers, and the demand for aid to be given directly to the authorities. Many of these challenges persisted into 2009. Obstruction in the delivery of aid to cyclone victims also occurred as a result of intimidation, abuse, and arrest of relief workers, especially private volunteers. Several interviews revealed that relief workers often had to provide some form of bribery in order to work. Difficulties in collecting and accessing reliable information, particularly that which was necessary for needs assessments and coordination of relief activities, was a major concern for relief workers. This was exacerbated by information released through the state-controlled media outlets, which frequently minimized or obscured the extent of the disaster or needs of the victims to create the impression that the government's relief efforts were meeting the needs of survivors. Human rights are the legal underpinning of all humanitarian work pertaining to natural disasters. There is no other legal framework to guide such activities, especially in areas where there is no armed conflict. If humanitarian assistance is not based on a human rights framework, it risks having too narrow a focus and cannot integrate all the basic needs of the victims into a holistic planning process. There is also the risk that factors important for recovery and reconstruction later on will be overlooked. Further, neglecting the human rights of those affected by natural disasters effectively means no account will be taken of the fact that such people do not live in a legal vacuum. They live in countries with laws, rules and institutions that should protect their rights. The report and its addendum, the Operational Guidelines on Human Rights and Natural Disasters, also underscored that protection of human rights and provision of assistance to the populations are the obligation of the government of the affected country. Additionally, the inclusion and consultation with individuals from the affected community during the decision-making process and implementation of relief activities are also fundamental principles set forth in this document. The Operational Guidelines further noted the essential role of community members in ensuring "effective, equitable, and sustainable" relief and recovery programs [46, 47]. The important role of local communities in disaster responses was also recognized by ASEAN, of which Burma is a member, that called for the promotion of "public participation in programmes related to disaster risk reduction and emergency responses in order to promote community resilience to disasters" and "partnership with relevant stakeholders, including local communities, non-governmental organisations and private enterprises, and strengthen cooperation with United Nationals and relevant international organisations". In the case of Burma, as reported here, community members were among the first and most effective responders during the crisis. Unfortunately, as is reported here, there is consensus that donor aid has been and continues to be inadequate for the needs of the affected populations [36, 49, 50]. Many needs assessments and reports done in partnership with the Burmese government, including reports focused on the social impacts of the storm, have generally not reported on human rights issues, despite the central role that this has been recognized to play[48, 51]. The assessment and reporting of human rights concerns is further limited by censorship, and the SPDC tightly controls independent collection and dissemination of information, including reporting on the needs of communities[52, 53]. In this context, private and independent relief organizations such as EAT are in unique positions to conduct rights investigations and play an essential role to help ensure "effective, equitable, and sustainable" relief and recovery programs. As members of the communities, they have physical access to the most challenging, heavily-affected areas, especially those where foreign aid access is restricted by the authorities. And, as members of storm-affected communities, they aroused less suspicion while traveling, were trusted by the survivors and volunteer relief workers, and were instrumental in gauging the priorities and needs of the local people. Using participatory methods and operating without the knowledge and consent of the Burmese junta or its affiliated institutions, they were thus well-positioned to serve as independent, community-level monitors of human rights. These assessments reveal that ongoing human rights abuses have occurred in cyclone-affected areas in the context of relief and reconstruction efforts. These included official interference in relief efforts, harassment and intimidation of private relief workers, misappropriation and confiscation of aid, controls on information, confiscation of land from survivors, and forced labor. Our findings show that the difference of having unhindered access to affected communities and ensuring the anonymity and confidentiality of those willing to testify uncovers realities on the ground that stand in contrast to evaluations conducted in partnership with the ruling junta[27, 48, 51, 54, 55]. This assessment was subject to several limitations. Due to security and logistical concerns, it was not possible to conduct a quantitative population-based assessment in tandem with the qualitative human rights investigation. As a result, estimations of the prevalence of human rights abuses were not possible. In addition, the disclosure of identifiers, such as specific village names where the data were collected, was also impossible due to security considerations. To date, at least 21 individuals involved in private cyclone-related activities have been arrested, none associated with this assessment, and some have been sentenced to long prison terms, underscoring the reality of these security concerns in Burma. At least eight additional community activists and cyclone relief volunteers were sentenced to long prison terms in January 2010. Despite such limitations, the use of in-depth interviews, however, offer several strengths to the investigation. Foremost, interviews allow for an understating of the nuanced experiences among survivors and relief workers. The use of qualitative methods also allowed for refinement, addition of questions, and adjustment of the interview guide when new themes emerged over time. Additionally, the ability of the research team to use probes to collect further details of experiences allowed for the verification of veracity and internal consistency, as well as the separation of personal experience from hearsay. An additional limitation was the selected nature of the interviewers and interviewees, and the potential biases inherent in non-random sampling of participants. While population-based approaches would arguably have generated more generalizable findings, this was not feasible for logistical and security reasons; however, non-random approaches, such as used in this investigation, should not undermine the veracity of any individual experience of abuse. The limitations of this investigation should not detract from the reality that independent community voices in cyclone relief and reconstruction activities should be encouraged. This is particularly important in countries such as Burma, one of the most corrupt governments in the world, and where widespread, systematic human rights abuses of civilians has been widely documented, including violations of several UN Conventions to which Burma is signatory, such as the Convention on the Rights of the Child (CRC), the Convention on the Eradication of All Forms of Discrimination Against Women (CEDAW), and the International Labour Organisation Convention 29 on Forced Labour[17, 57–59]. And, even before Cyclone Nargis, strict limitations on international humanitarian assistance, particularly information gathering and travel for international staff, were a reality for aid organizations[60, 61]. Community-led monitoring of human rights violations are an important part of assessing responses to complex humanitarian emergencies, particularly where states are unwilling to or have failed to do so. The Emergency Assistance Team (EAT) was established on May 6, 2008, through the collaboration of several Burmese community-based organizations on the Thai-Burma border with years of experience working to provide health and education services, training in human rights, health, education, women's rights, leadership skills and responding to emergencies. EAT works at the grassroots level to provide aid and assistance to the people affected by Cyclone Nargis in the Irrawaddy and Rangoon Division areas. The Center for Public Health and Human Rights (CPHHR) at the Johns Hopkins Bloomberg School of Public Health uses epidemiologic methods to investigate human rights violations and their impact on the health of individuals, communities and populations. The Center partners with grassroots organizations, human rights groups, and public health researchers and practitioners to address the needs of underserved minorities, ethnic groups facing state violence and discrimination, and stigmatized groups at risk for HIV/AIDS and other epidemic threats. The authors would like to thank all the relief workers and survivors that volunteered information for this assessment. The authors also thank our local human rights colleagues, such as the Karen Human Rights Group, and other organizations who declined to be publicly named due to security considerations, for their assistance in conducting this assessment. We look forward to the day when their work can be publicly acknowledged. VS contributed to the conception and design, acquisition of data, and interpretation of data; was involved in drafting the manuscript and revising it critically for important intellectual content. NM contributed to the acquisition of data and interpretation of data and was involved in drafting the manuscript. CL contributed to the conception and design, acquisition of data. JL contributed to the conception and design, acquisition of data. AW contributed to the conception and design and interpretation of data, was involved in drafting the manuscript and revising it critically for important intellectual content. BD contributed to the acquisition of data. MM contributed to the conception and design, acquisition of data, and has given final approval of the version to be published. CM contributed to the conception and design, acquisition of data. CB contributed to the conception and design, acquisition of data, and interpretation of data, was involved in drafting the manuscript, and revising it critically for important intellectual content. All authors have read and approved the final manuscript.